Hope you all had a great weekend! Ours was incredibly busy but fabulous. I had a wonderful time at our annual We CAN Stamp convention with some of my favourite stamping friends. Thanks for a great day ladies! Then spent Sunday afternoon with Nicole and some of her friends and family at her workshop. Today I am sharing the projects that we are doing at this months Touch of Class on September 23rd. If you are looking for a fun night out where you can learn something new, this is the perfect class for you. No experience is required. The projects are planned so that anyone can easily create them but still include something for the experienced stamper. The class fee is $15 and includes all supplies. Please RSVP your attendance by September 20th. 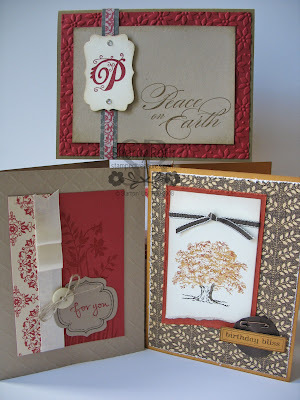 If you can't attend the class, but would like the finished cards. You can purchase the cards for $15 plus the cost of shipping (if required). Simply send me an email and we can work out the details. Don't forget to get your Creative Artwork Kit - only available until Sept. 22nd.